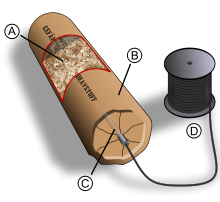 This short, thin cylinder of explosive material has a fuse that must be lit before it is thrown or set. Lighting a stick of dynamite is a move action, and the dynamite goes off in the same round or up to several minutes later (depending on how long the fuse is). The explosive has a blast radius of 5 feet and deals 2d6 points of bludgeoning damage. Anyone caught within the blast radius can make a DC 15 Reflex save to take half damage. It’s possible to bind together several sticks of dynamite so they ignite and explode at the same time. Each additional stick increases the damage by 1d6 (maximum damage 10d6) and the burst radius by 5 feet (maximum burst radius 20 feet).